What types of cell phones has Chip Off Forensics been performed on? Over the years Binary Intelligence has had the opportunity to service the mobile and cell phone forensic field with logical and physical acquisitions. We started to research and develop a proven chip off forensic process about 3 years ago. We work with devices like Blackberry, Apple iPhone / iPod, Android, Tracfone, Samsung, LG and other feature style phones.Chip Off forensics is simply a more advanced form of cell phone forensics (mobile forensics). It does not require the phone to be operational. The phone can be broken, locked, water damaged, and even run over with a car. With out a doubt Blackberry has been the most difficult device to master. 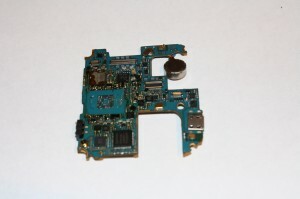 RIM has utilized a thick, nasty, hard epoxy to secure the BGA memory chip to the motherboard. This epoxy is plastered on the sides of the chip, underneath the chip and even on top of the BGA chip. 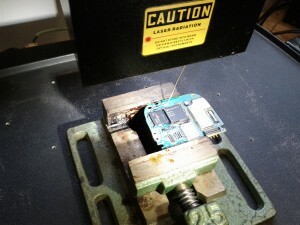 This epoxy makes performing chip off forensics difficult. 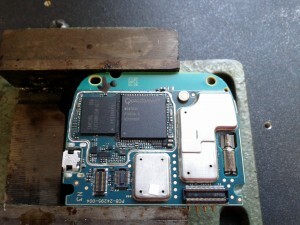 The only proven way to remove this epoxy is to heat it and slowly remove it. Not only are you removing the epoxy from the sides and top of the chip, but you also must remove the epoxy from the pad portion of the BGA chip. These pads are very sensitive and even the SLIGHTEST scratch can sever connections and render the chip unreadable. The risk is higher with Blackberry devices, but the end result can really be extremely beneficial to any case or individual. Binary Intelligence has successfully removed, repaired, and read dozens and dozens of chips from an endless list of phone models. The amount of data recovered from Blackberry’s vary, but they seem to provide great results. One particular phone yielded over 20,000+ emails that were active and deleted. The knowledge and popularity of chip off forensics is really growing. We have been getting work not only from government agencies and law firms, but from private individuals as well. Some of these private individuals need our help finding closure after a close family member has passed away or they are in the middle of a sensitive divorce/ child custody battle and need the data for court. That’s how competitively priced Binary Intelligence is when it comes to chip off forensics. As always this is a very destructive process and you must find a proven and experienced professional to assist you with any chip off forensic process. Feel free to call me and chat my direct extension at the office is x713. What about the blackberry or iphone encryption?? Doesn't encryption on these devices still make it difficult to perform forensics after the chip off? ?